This is based on a recipe in ‘Muffins scones and breads’ in the Austrailan Women’s Weekly cookbook series. There is enough for 6 as an accompaniment to soup or salad. It’s fairly quick to make as it requires only one rising. Mix the yeast and sugar with 100ml of the warm water. Cover, and leave in a warm place for about 10 minutes until it starts to ferment. Meanwhile sift the flours together into a large mixing bowl. When the yeast is ready, warm the flour briefly in the microwave (say, 20 seconds on high). Mix the cheese and herbs into the flour, add the yeast mixture and 2 tbsp of the olive oil, and a further 100g of the water. Mix to a soft, but manageable, dough. If too dry add further water (if too wet, knead in some more flour). Knead for about 5 minutes. 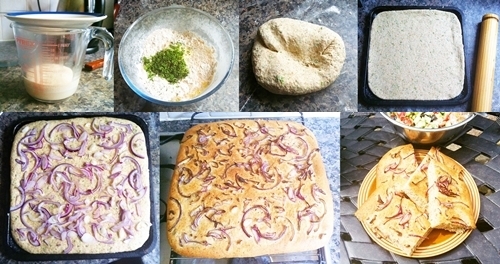 Roll out the dough and place it so that it covers a baking tray (I used one 30cm square). Cover and leave in a warm place to rise (until it has doubled in depth). Heat the oven to 220C (gas mark 8). Spread the onion slices over the top, and sprinkle with sea salt and the remaining olive oil. Bake for about 25 minutes. Pleace on a wire rack to cool.